Love it or hate it, reality TV is here to stay. In the last decade, more and more outlets (including networks) have put reality programs front and center in primetime programming blocks, and personality-driven reality shows have overtaken "infotainment" specials. That all means more between-projects work for the documentary filmmaker, but does it mean any more hope of getting a documentary series on the air? That all depends on your definition of documentary. R.J. Cutler sets the bar for that definition high and old school at "cinema vérité." Cutler is a producer behind such respected feature films as The War Room (Dirs. : DA Pennebaker, Chris Hegedus) and last year's The September Issue, which he also directed; in addition, he created such landmark vérité series as Freshman Diaries (2003), The Residents (2003) and American High (which actually won the first Emmy in the Reality category back in 2001). But Cutler was also executive producer on TLC's Flip That House, Oxygen's Pretty Wicked and CBS' Greatest American Dog, so he knows what he's talking about when he says that "formatted" reality shows have "different objectives than observing and telling the truth...You're thinking about season two and you're wondering about act-outs and maximizing your drama for a television audience." Even worse, says Cutler, reality paychecks lure filmmakers away from getting around to making their movies. Cutler suggests those shows are artifacts of a bygone era: "It had become very difficult to set those shows up by 2005, 2006," he says. He sees "observational" shows without a formula at odds with the nature of the beast today, which Cutler describes as a "shark" that "feeds on eyeballs." Cutler originally shopped his 2009 documentary The September Issue, about the production of the largest issue in Vogue magazine's history, as a "true documentary" TV series, but met with network "anxiety about the documentary process" that could not guarantee a baked-in ending. He went forward with the project as a feature film, confident that his unique access to editor-in-chief Anna Wintour would deliver gold: "I knew that, You know, life is pretty awesome! That's what the vérité filmmaker counts on." Cutler is currently developing several new TV series, including a documentary series, through a first-look deal with Fox Television Studios inked earlier this year. "We'll see if people buy it or not," he says of the doc series. Two "observational" series that aired this year to decent ratings might help his cause: the Peabody Award-winning Sundance Channel series Brick City (Dirs./Prods. : Mark Benjamin, Marc Levin), about the revival of Newark, New Jersey; and ABC's Boston Med (Exec. Prod. : Terence Wrong), about the staff and patients at three Boston hospitals. Plus, in 2011, HBO gives the Grey Gardens treatment to the show credited (or cursed) with the title of America's first reality show--the 1973 PBS series An American Family, a vérité masterpiece about the Loud family of Santa Barbara that shocked viewers with scenes of a marriage falling apart and the openly gay lifestyle of eldest son Lance. HBO's Cinema Vérité, which will include insight into the production of the series, is directed by American Splendor team Shari Springer Berman and Robert Pulcini, with Tim Robbins and Diane Lane playing parents Bill and Pat Loud and James Gandolfini as Craig Gilbert, the cantankerous PBS producer who created the series. HBO hired Alan and Susan Raymond, the husband-and-wife directing team who spent seven months filming the Louds in 1971 and later directed two follow-up specials on the family, as consultants. Says Alan Raymond, "The success of the series was that it took the vérité technique but put it in the package of a kind of traditional television format, which was the weekly series. And I think that the fact that [Bill and Pat Loud] got divorced gave the series some structure--and was part of the legacy of the series." That legacy manifests itself in R.J. Cutler's American High, Jonathan Murray's The Real World and Matt Groening's The Simpsons. The Raymonds' 1977 project Police Tapes , about the crime-ridden South Bronx, also inspired COPS, but the Raymonds say shows like The Real World and COPS are the "evil spawn" of their vérité efforts. "The point of cinema vérité is that life unfolds and the drama unfolds before your eyes," says Susan Raymond. "You have to align all the stars to be there at the right time and have good light exposure and a good sound situation, right? All these things have to come together to make it happen. But reality TV hasn't got that patience, so they make it happen." But Thom Beers, creator of the Discovery Channel hit Deadliest Catch, about the rough life of Alaskan crab fishermen, dismisses critics who suspect his show is in any way faked for dramatic effect. "You think we have the time to think, ‘What the hell, we need to re-shoot.'?" says Beers. "It is what it is and you got to catch it." 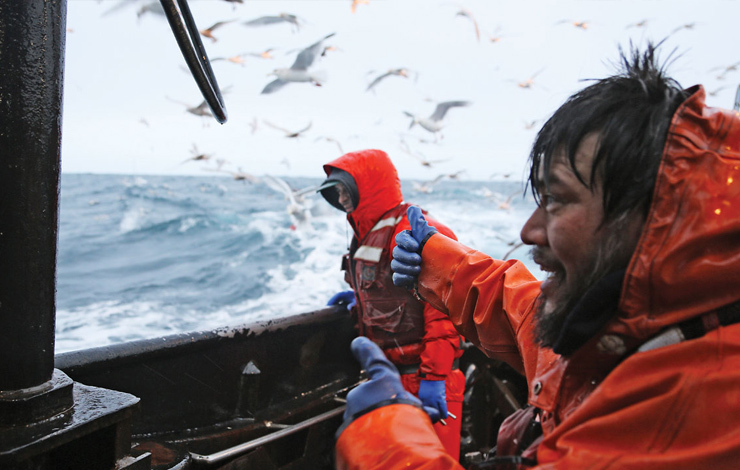 Deadliest Catch is Discovery Channel's highest-rated show, which might be proof that TV viewers do crave stories about real people working real jobs. Deadliest Catch is just one of 40 hits (the roster includes blockbusters like Ice Road Truckers and Ax Men) created by Beers' Original Productions for such muscle-bound outlets as Discovery, History, Spike and National Geographic. Says Beers, "My formula for those shows is simple: high risk, high reward, in an exotic location." Beers insists he has the final say in shaping his shows; he even once threatened to quit when network execs tried to diddle with his vision, telling them, "‘Either you're making the show or I am.' They let me make it, I made a hit TV series and I'm in Season 6 now." All of the footage used in Deadliest Catch comes from two-man crews embedded on working boats, shooting 18 hours a day, seven days a week, for two months at a time. Producer/cinematographer Todd Stanley came up with a unique, semi-automated solution to covering an entire boat with just two shooters (one doubling as the field producer), three fixed cameras and an automated mixing board picking up audio from two wireless mics and one fixed mic. Stanley was assigned to film Captain Phil Harris, the crabby star of the series, three years ago. The producer considers his job as straight documentary: "I love to document; I never want to influence." Instead, he pitched in with the crew, winning over the captain: "I cooked meals, I did the dishes, I went out on deck, I cut bait up, I did every job on that boat. I could run that boat right now." After three years together in the wheelhouse, Stanley and Harris became such close friends that the filmmaker was allowed to film him on his deathbed in Anchorage following a stroke, and he was the first person the captain requested to see in the recovery room. Harris used his eyes to telegraph that he wanted Stanley to turn on his camera. "I'm like, What? You want me filming?" says Stanley. "And he scribbled down on a piece of paper, ‘Yeah, you've got to get the ending, the ending to the story.'" Stanley's intimate footage of the final days of Harris aired this summer on Season 6 of Deadliest Catch, netting 8.55 million viewers and winning the primetime block for the entire week across all outlets (and crushing the finale of The Hills). This fall, Stanley heads back out to sea to shoot Season 7, and Beers will oversee 12 additional Original Productions projects set to air across six outlets. The Raymonds will see the fictional version of themselves (played by Patrick Fugit and Shanna Collins) when Cinema Vérité premieres on HBO in 2011. "I'm looking forward to the weirdness of it all," says Susan. The couple's latest project, a documentary about dyslexia, also airs on HBO, in January 2011. You can buy DVDs of their two Loud family specials, American Family Revisited and Lance Loud! A Death in An American Family, at the Raymonds' website, www.videoverite.tv. You can see the original An American Family (which has never been released on video or DVD) at the Paley Center archives in Los Angeles and New York. While you're there, check out the contentious 1988 panel, filmed at the Paley Center in New York (then called the Museum of Broadcasting), featuring the Raymonds, Craig Gilbert and Grant and Michelle Loud. Elizabeth Blozan is a freelance writer and frequent transcriber of hundreds of hours of field footage for documentaries and reality TV shows.